In the following guide, you will learn more about fire sprinklers, what they are, why they are essential, and why you should consider investing in one. How Important Are Fire Sprinkler Systems? How Much Do Fire Sprinkler Systems Cost? What are The Common Types of Fire Sprinklers? Serving Anaheim, Irvine, San Clemente, Dana Point…as well as San Juan Capistrano, Laguna Niguel, Lake Forest, Laguna Woods, Mission Viejo, Ladera Ranch and surrounding Orange County locations. SHORT ANSWER: What is the Importance of Fire Sprinklers? 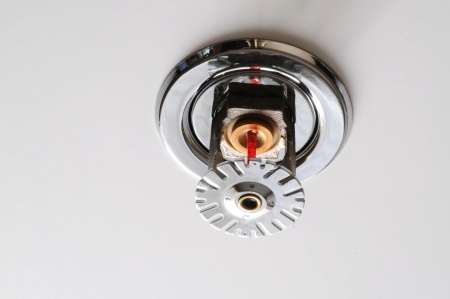 IN-DEPTH: Do I Need to Install a Fire Sprinkler in My Home/Building? A fire sprinkler system will provide critical safety elements to people occupying, visiting, and be using a building. These systems are designed to detect the heat caused by fire and to activate automatically. By so doing, they will provide water to extinguish or slow down a fire. By the time your fire sprinklers detect enough heat and become activated, the fire might already be underway. When this happens, the sprinklers will provide adequate early suppression so that people in the building can evacuate safely before the fire gets worse or spreads. Additionally, fire sprinklers can effectively reduce the severity of fires – at least to such an extent that firefighters can easily and safely access the affected areas and put out the fire completely. If you live, work, or own property in Orange County, you should know that Californian law requires that you install working fire sprinklers in your property. NFPA 13 – the Standard for the Installation of Fire Sprinkler Systems is one of the standards that is widely used to cover fire sprinkler requirements – particularly in commercial buildings. This is a national standard that lays out the conditions and procedures for the installation of fire sprinkler systems. It also gives managers, owners, and builders a set of standards to follow in order to meet (or even exceed) basic fire safety requirements. In every case, fire system designers, building managers, and all related professionals are required to consult with local Orange County fire safety authorities for specific guidance in the design, installation, and maintenance of fire sprinklers and associated systems. Similarly, a wide variety of federal, state, and local regulations are in effect and you must follow them carefully so as the meet Orange County’s building codes and safety requirements. If you have a newly built property, you must install automatic fire sprinklers especially if the fire area exceeds 5000 square feet. You should also get a sprinkler system after any renovation or remodeling where the fire area goes over and beyond 5000 square feet, or if there is a single tenant expansion that requires a new occupancy certificate that effectively increases fire areas beyond 12000 square feet. You must install fire sprinklers throughout your property and ensure that it is designed in such a way that it will provide maximum coverage to fire areas. In the same way, you must install sprinkler systems in a townhome with two residential units per building or more. If your property is over 55 feet in height, you must get a professional to install an automatic sprinkler system. Additionally, you need to install fire pumps. 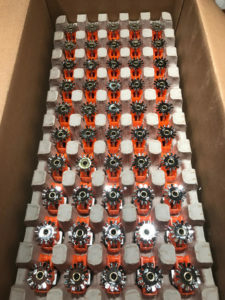 These are designed to increase the pressure amount in your fire sprinkler system in case the system is fed through a non-pressurized water tank or if the local municipal water system in your Orange County area does not provide sufficient pressure to supply enough water to your fire sprinklers. Where possible, you should ensure that the fire pumps are in a separate building. However, if the pumps are in the same building as the fire sprinklers, they should be installed in a proper fire rated room accessible through an exterior entrance. The entrances to the pump room should also be marked clearly so that people and firefighters have an easier time finding and accessing the room. In the same way, you must ensure that the valves controlling the water supply are easily accessible and easy to operate. If you get the valves installed in a stairway, you must ensure that it is protected and can be accessed easily in case of a fire. Additionally, you should clearly mark and identify the valves – with exterior signs showing where the indoor valves are located. The valves should additionally be marked with clear information indicating the locations and areas covered. In case there are self-storage facilities, you must install automatic fire sprinklers all through the facility. However, this requirement does not apply to one-story facilities with one-hour fire barriers or without indoor corridors. TAKE-AWAY: As per the California Residential Code R313.2, you should install automatic residential fire sprinklers in new two- and one- family properties. The Municipal Code also requires automatic fire sprinklers in new buildings taller than 1000 square feet. In the same way, new remodels and additions should comply with Municipal Code 150.01 (J). New building classifications should additionally comply with divisions D, E, and G – particularly with regards to when you alter an already existing building. SHORT ANSWER: What is the Average Cost for Fire Sprinklers? IN-DEPTH: How Much Should I Pay for a Fire Sprinkler? Commercial and home sprinkler systems are handy machines for putting out fires when they occur. Although you can use a fire extinguisher for fires that you know about, residential fire sprinkler systems are a better option because they will quell even those fires that you are not aware of. The US Fire Administration, which is a FEMA division, reports that indoor sprinkler systems are effective at reducing the likelihood of fire fatalities by at least 80% while they reduce the chances of property damage by around 71%. This is why hundreds of municipalities – as well as California – mandate the installation of sprinklers in residential and commercial properties. Still, fire marshals and industry experts are now strongly recommending that every home has an automatic fire sprinkler regardless of any local Orange County ordinance. This is because fire sprinklers are the single best pieces of equipment for fire protection that you can get in your home. However, perception and myths have made many people – both tenants and property owners averse or reluctant to the idea of installing these machines. The biggest obstacle to fire sprinklers is cost despite the fact that installing sprinklers in property is both cost-effective and reasonable. Most people are of the idea that all sprinklers in their home go off whenever a fire occurs. However, this is not how it works. In most cases, only the fire sprinkler heads that have detected the heat from fire get activated. This is why some single heads can stop the fire before it gets the chance to spread. Since most heads are designed to cover 144 to 200 square feet, it follows that they will remain flush against the ceiling or wall until they are deployed. This means that they have little impact on the aesthetics of a home. A recent research report by NFPA shows that the cost of fire sprinklers has significantly dropped in the past few years. For instance, the average cost of a sprinkler system in 2008 average $1.61 for a square foot of installed fire sprinklers. By 2013, the cost went down to $1.35 per foot. These costs have been going down since then. The reason could be as a result of mandates that have ensured more contractors are now installing automatic fire sprinklers in Orange County and all over California. Today, the average cost is less than $1 for a square foot in California. Even though NFPA does not record the statistics for the installation of fire sprinklers in already existing homes and residential properties, there is still a need to augment existing water and plumbing systems and to cut into walls. This need significantly increases the initial costs. However, the costs vary from one case to another. For instance, you can reasonably expect to spend about $3500 to retrofit your 2400 square foot home. In the same way, as more sprinklers get installed, the price keeps going down. Since the California law was instituted in 2011, builders have installed fire sprinklers in more than 70,000 homes. Many municipalities and states – including Orange County and California – now have ordinances and laws for fire sprinklers in place. These laws require that you install a sprinkler system in every new construction. The systems will usually activate when the inside of your property reaches a certain critical temperature – mostly around 155 degrees Fahrenheit. So, how much can you expect to pay for your fire sprinklers? In general, there are two main types of systems. These include multipurpose systems that will be integrated with your plumbing system that is already existing in your building. A standalone system, on the other hand, has its own unique and dedicated plumbing. In most cases, multipurpose systems tend to cost less. This is because they will use the plumbing system that is already in place on your property. However, you might pay a bit more to get a sprinklered square foot. The sprinklered square footage will differ from the living area square footage. This is because some of the areas of the property – such as crawl spaces – might not be thought of as living spaces but might still require fire sprinklers. The Fire Sprinkler Cost Assessment for 2009 by the Fire Protection Research Organization, for instance, showed that home builders spent anywhere between $0.38 and $3.66 for a sprinklered square foot. However, the average cost was $1.61 for a sprinklered square foot. These figures also apply to the average commercial fire sprinkler system cost per square foot. Therefore, an average 2200 square foot home would cost you about $3500 while you might pay about $5600 to get a fire sprinkler system installed in a 3500 square foot home. However, you should keep in mind that most fire sprinkler systems will cost between 1 and 2% of the total cost of building a new house. If you have an already existing property, the average cost of an automatic sprinkler will be anywhere between $2000 and $16000. In general, the low end of this range applies to homes that are an average of 2000 square feet and located in a community that already has fire sprinkler laws and ordinances in place – such as Orange County. The high end of this range, on the other hand, applies to larger homes that exceed 3000 square feet in size. The cost to install commercial fire sprinkler systems is also in the same range. Communities that have these ordinances in place tend to experience general acceptance in the market. This means that there is an increase in competition, which tends to lower the prices. Today, engineered lumber is more frequently used in new Orange Country constructions. It is stronger, less expensive, and more durable than most traditional building techniques. However, it also presents a greater risk of fire. This is according to a recent Underwriters Laboratory study. In the study, the lightweight construction assembly used collapse around 6 minutes after the fire began whereas traditional construction only collapses 18 and a half minutes after. This puts the occupants in such buildings as well as firefighters in danger. This is because most construction companies are using tons of shortcuts and synthetic lumber. Fire chiefs have also reported arriving at fire scenes only to find the newly constructed homes that have already burned down. The contents of a home can also increase the risk of fire. Today, there are more plastics and synthetics than there were in the average home 50 or so years ago. These products burn a lot faster and hotter. Luckily, the International Residential Fire Code now considers lightweight construction. Testing shows that adding underfloor protections – that the IRC (international residential code) calls for – works well as an ignition barrier that will add anywhere between 15 and 18 minutes before the floor collapses. USFA also reports that fire sprinklers are beneficial because they will save you a great deal of money on the premiums you will pay for insurance. In particular, you can expect your insurance rates to drop anywhere between 6 and 15 percent after you get a fire sprinkler system installed. Although insurance companies treat these systems differently, you should still try to secure a discount when you install a fire sprinkler in your home. However, if you just have a fire suppression system, you should still ensure that you maintain it regularly. Both commercial and residential fire sprinkler system maintenance requires that you check the fire sprinklers to ensure that they have not been blocked. You may also want to open the drain valves every once in a year to make sure that the water flow in unimpeded. Additionally, get a licensed plumber to perform an annual inspection of the backflow prevention device in the system. Although Orange County – or any other municipality for that matter – requires that you perform annual maintenance, this is just good practice. You can do it yourself or get a professional to perform the maintenance at a small nominal fee. After all, failure to perform regular maintenance will only result in more expensive repairs down the line. SHORT ANSWER: Are There Different Types of Sprinklers? IN-DEPTH: Which Sprinkler System Should I Get? Whether you get a commercial fire sprinkler system or a residential fire system, there are basic fire sprinkler requirements that dictate the different designs that it should come in. Both commercial and residential fire sprinkler system designs are different in their own way. However, they are all the same in the sense that they are designed to spray water on a fire so that it does not get out of control. Deluge fire sprinklers are similar to wet pipe sprinklers. The only difference is that their heads are open throughout. This means that they will not simply be activated by the heat from a fire. Instead, they are activated by specialized fire alarms. The alarms will cause the valve to open automatically and release water to put out the fire. Once the valve has opened, it will not close until you turn it off manually. 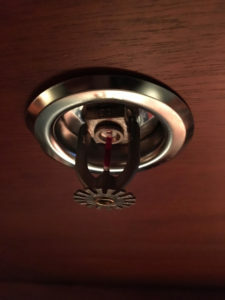 These types of fire sprinklers are not common in offices or homes. Instead, they are often used in those areas where there are concerns about the rapid spread of fire. These sprinklers are usually found near warehouse bay entries, high rise windows, and any other place where fires could escape easily and quickly. These sprinkler systems are quite similar to the wet pipe variety. However, the water will not be stored in the pipes. Rather, the pipes contain nitrogen gas or pressurized air. Therefore, when the system detects a fire and the sprinkler heads open, the fire sprinklers will release the gas. After that, a valve will open to allow water to easily and quickly flow out through the sprinkler heads. Although this system causes slight delays in the discharge of water, it is quite useful in those properties where water tends to freeze when it is kept inside the pipes. Pre-action fire sprinklers are a combination of the dry pipe and the wet pipe systems. Water will not be stored in the pipes until the fire detection device has detected the heat from the fire. 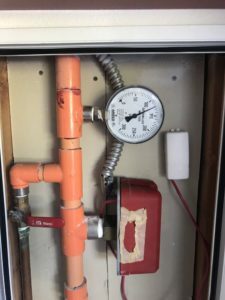 After that, the detection device will open a valve and let water flow into the fire sprinkler system before the heads open. Once the head opens, the sprinkler system will react as fast as a wet pipe system. These types of fire sprinklers are better suited for locations that are at a particularly high risk of getting serious water damaged in case the fire sprinkler is activated accidentally – such as if someone smokes near the system. Wet pipe systems are among the most common types of fire sprinklers you will find in Orange County and across the greater California area. In the sprinkler, water is stored in the pipe. It will then be released by the heat-activated heads of the fire sprinkler. Wet pipes are advantageous in the sense that they can easily and instantly activate. This means that there will be no lag time from the moment the heads open to the time the water is pushed out. There are different residential and commercial fire sprinkler system designs. Irrespective of the type of system you need for your commercial or residential fire sprinkler installation, you can be sure that California Fire Protection and Backflow has got you covered. In case you are looking for an Orange County expert to install a fire sprinkler or maintain your existing fire suppression system, you can be sure that we are here for you. Call us today at (949)770-5371 to find out more.